Last week, I took a look at illustrators who currently have picture books out on shelves, who also did—or still continue to do—editorial illustrations. Let’s call it “The New Yorker Effect” just for fun. Well, I already did: The column is here, if you missed it last Friday. And because I love to show spreads from these picture books, I’m here today—with Frank Viva’s coffee cup in hand (pulled from a spread below)—to show lots of art. Pictured above is one of Frank’s spreads from Along a Long Road (Little, Brown, June 2011). Along a Long Road is one beautiful book. I just said the title twice. Notice? One reviewer has described these spreads as “meditative,” which is a great word for this book. And it just occurred to me the title is rather hypnotizing, too. And note things like Ljungkvist’s (she will stop by for an interview soon, and I’ll have to ask her how to actually pronounce that consonant-heavy name. Isn’t it fascinating just to look at?) … Where was I? Oh right. Scroll down to Ljungkvist’s “Tables for Two” editorial illustration for The New Yorker. Aha! A predecessor, I see, to her very fun Follow the Line books for children. 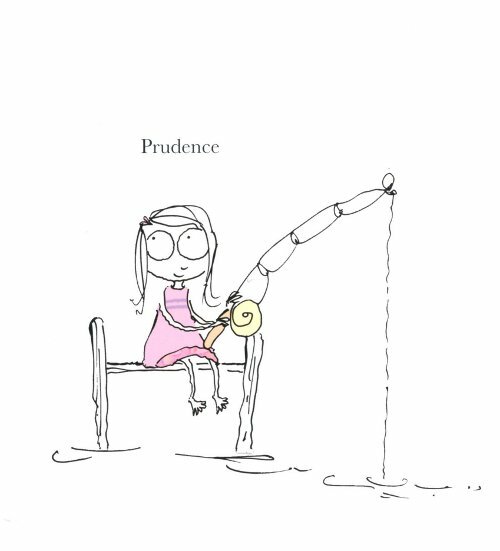 It’s all exciting for Illustration Junkies like me and many 7-Imp readers to see how this editorial art informs their children’s book illustration — or perhaps vice versa. Note of interest for folks in New York City: Stephen Savage tells me that he and Frank Viva will do a reading at The Powerhouse Arena on Sunday, July 10, from 4-5pm. More information is here. 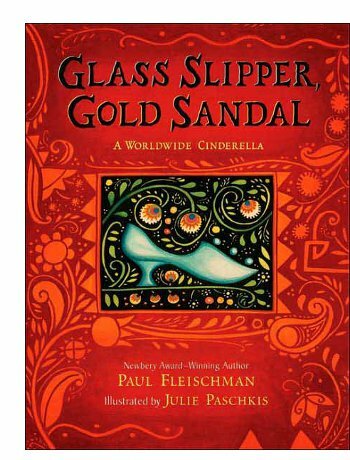 I’m not posting any picture-book art today, but I will share my project of the week: My felt-board adaptation, let’s call it, of Paul Fleischman’s and Julie Paschkis’s 2007 picture book collaboration, Glass Slipper, Gold Sandal: A Worldwide Cinderella. Every year for my pubalic liberry’s summer reading program, I do volunteer storytelling. I try to mix things up but usually end up whippin’ out my felt board. I just can’t help it. As a wise friend said recently, “felt boards are like magic to our pixel-saturated children.” She’s right, you know. So, I always end up learning a new story and creating new felt pieces. This year, since the summer reading program theme is “One World, Many Stories,” I decided to take Fleischman’s book and learn it, and I’m making Paschkis-inspired felt-board pieces for the journey of Cinderella around the world. My plan is to start off by asking the children to tell me the story we tend to tell in this country (based on Perrault’s version), and then I’ll run through it as Fleischman does with felt pieces representing elements of the story as it’s told all over the world. The pieces in this photo above are just a portion of the many I’ve made for this tale. (You may click on the image to enlarge it, if you’re so inclined.) This is decidedly more complicated than last year’s story, but so far, so good. And the fairy godmother isn’t up there in that pic. Right now, I’m not pleased with her. She looks like some sort of sickly Jedi. I need to fix her. In a bad way. I’m off now to continue cramming on this story. I’ve got some children to entertain on Wednesday. See you later this week with some actual picture book illustrations to showcase. Until then…uh, may the magic-wand force be with you. “But on Monday, the square was cut into pieces and poked full of holes. It almost pains me to post anything over top of this post, since I really love the colors of Claudio Muñoz’s artwork, but onwards and upwards. At least it will always be here at 7-Imp for us to see. I am, however, happy to share this picture book today. It’s called Perfect Square (Greenwillow, April 2011), and it’s from graphic designer and children’s book illustrator Michael Hall. Hadn’t even heard of this one till Betsy Bird mentioned it in her mid-year Caldecott and Newbery predictions post. So I grabbed a library copy, and voilà! Here I am to showcase it, ’cause me likey. 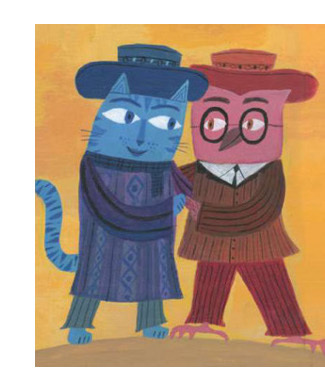 This morning at Kirkus I take a look at three new picture books created by folks who migrated from the world of editorial illustration to children’s book illustration — Laura Ljungkvist, Frank Viva, and Stephen Savage. The link is here this morning. Next Friday, I’ll showcase some art from each book. 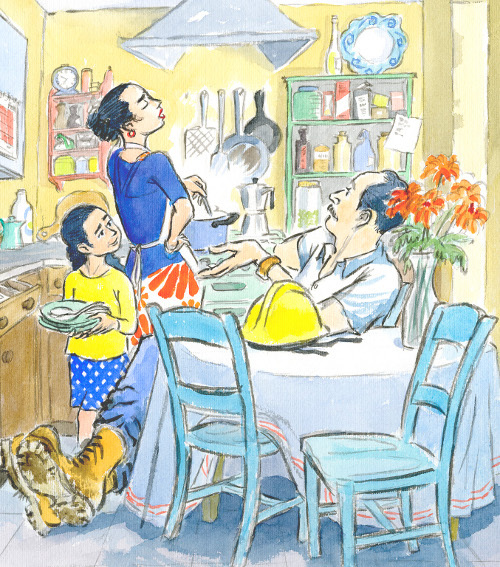 Last week’s column was all about one of Nina Crews’s newest titles, The Neighborhood Sing-Along (Greenwillow, May 2011), as well as the picture book debut from Meg Medina, Tía Isa Wants a Car (Candlewick, June 2011), illustrated by Claudio Muñoz. Since I can’t write about picture books and NOT show you art (I just worded that sentence in a very complicated manner, didn’t I? ), here are some spreads from each book today. The spreads from Nina’s book are re-posted from my Tuesday chat with her. It’s here, if you missed it and are interested. Really hard-core wants a pet. 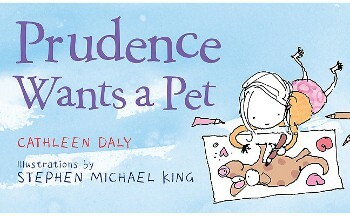 I got an early copy of it (F&G, as already mentioned); it then got lost/forgotten (sniff — sorry, poor little galley) under a huge stack of books; a friend with most excellent picture-book taste said in an email (I paraphrase here), “have you seen Cathleen Daly’s and Stephen Michael King’s wonderful Prudence Wants a Pet“? ; I immediately thought of this and thought, why, yes, I have seen that; weeks later, I had an epiphany and realized it was another book altogether; I went and found it; I read it; I laughed mighty hard; I fell in love with it; and I decided to post about it today. I wish it were merely that I am organized. Instead, I just occasionally have miraculously good timing. “MEW.” Prudence stands up and jumps up and down eight times. Her eyes get hot and tingly. She’s so happy it leaks out of her eyes a little. She didn’t know about those kinds of tears. I mean, just…where do I begin? That’s delightfully specific (“Eight times.” LOVE THAT.) It’s honest. It’s far from stale. And it so totally and precisely captures one of those first experiences a child has — in this case, happy, hot, tingly surprise tears. “Many of my favorite photographers…created images that capture the beauty of unexpected and unguarded moments,” author and illustrator Nina Crews wrote here last week at her blog. 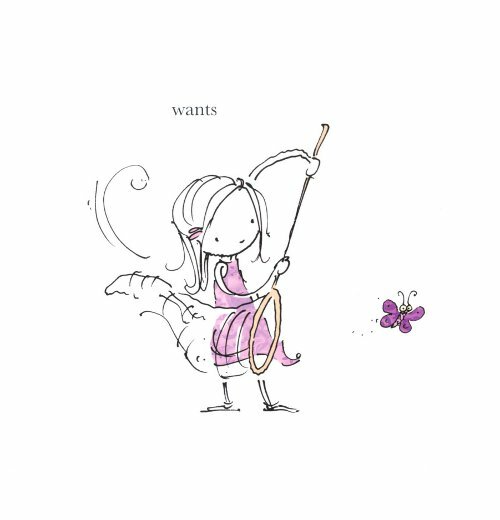 Nina herself manages to capture the same candidness in her own picture books for children, which are rendered via photography and collage. As I wrote last week at Kirkus, no one quite captures the rhythm and singular heartbeat of children’s play on their streets and playgrounds as Nina does with her camera. Since her debut title in 1995, she’s brought readers a host of books depicting children of various ethnicities playing together in urban neighborhoods. Her exuberant photos take up every inch of these spreads—there’s too much energy here (often a downright ebullience) for any wasted space. “Crews’ fans will be delighted,” a Kirkus reviewer wrote about her newest title, a contemporary version of Jack and the Beanstalk (“with spiky parts rounded off,” the review adds), which will be released next month by Christy Ottaviano Books/Henry Holt. And Publishers Weekly calls her May release, The Neighborhood Sing-Along (Greenwillow), “jubilant.” Indeed, it is. Have you seen it? Oh, please find yourself a copy by hook or by crook. 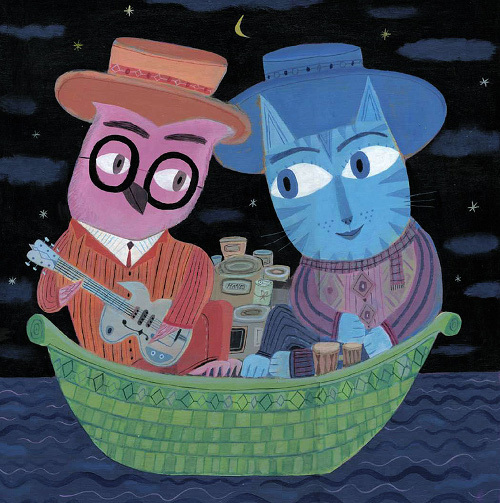 This illustration happens to be my very favorite picture book illustration from all of 2008. (What? Such categories actually do exist in my head.) And I’m taking the liberty of pulling it from the 7-Imp archives to re-post here. My visitors this morning mention this picture book below, and so I take every chance I can get to share Robert Andrew Parker’s art. You must click on that image to super-size it. No, really. You MUST. Because it’s a gorgeous spread is what it is. 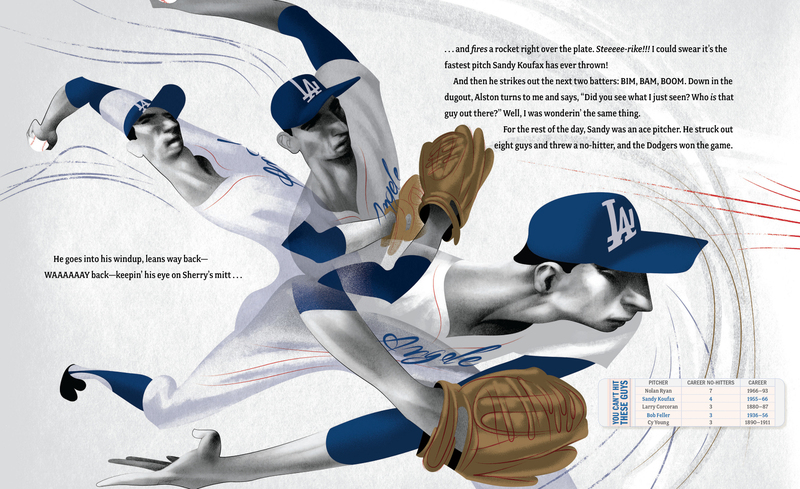 That comes from illustrator André Carrilho in Jonah Winter’s You Never Heard of Sandy Koufax? !, also published by Schwartz & Wade Books in 2009. Back to my visitors: I’m doing something different and altogether new for me here at 7-Imp this morning, the sort of thing that is more up Steven Withrow’s alley, but there’s a first time for everything, yes? I’m having a brief chat today with Anne Schwartz and Lee Wade, who five years ago created the Schwartz & Wade imprint at Random House. Evidently, they’re celebrating this anniversary with a blog tour of sorts. I was asked if I wanted to be involved, and given the fact that I’ve followed their picture books with interest over the past five years, I thought it’d be neat to take the opportunity to ask them their thoughts on picture books today and what’s next for the imprint. If I didn’t have my own writing deadline right now, I would have asked them more than just four whoppin’ questions, but I’m glad we were able to do this at all. The best part—bonus!—is that they share some picture book art below, and you all know what an illustration junkie I am. I know many of you 7-Imp readers out there are, too, so I’m happy to share. 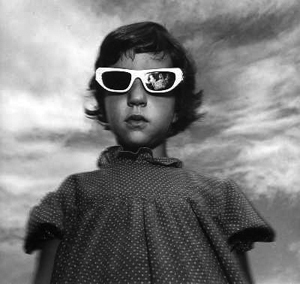 Meet the wee child version of author/illustrator Anna Alter, as photographed years ago by her father, photographer Gary Alter. This morning at Kirkus, I discuss two favorite summer picture book titles, Nina Crews’ The Neighborhood Sing-Along (Greenwillow, May 2011) and Meg Medina’s debut picture book title, Tía Isa Wants a Car (Candlewick, June 2011), illustrated by Claudio Muñoz. Nina Crews will be visiting 7-Imp next week for a breakfast interview, but first I take a look at her latest title (though her Jack and the Beanstalk comes out next month, and I’m looking forward to seeing that, too). The link is here this morning. Last week, I weighed in on Chronicle Books’ new picture book collection of Edward Lear’s nonsense poetry, as “masterminded” by Daniel Pinkwater (who visited 7-Imp here in 2009) and illustrated by Calef Brown (who visited with his elephant that same year). 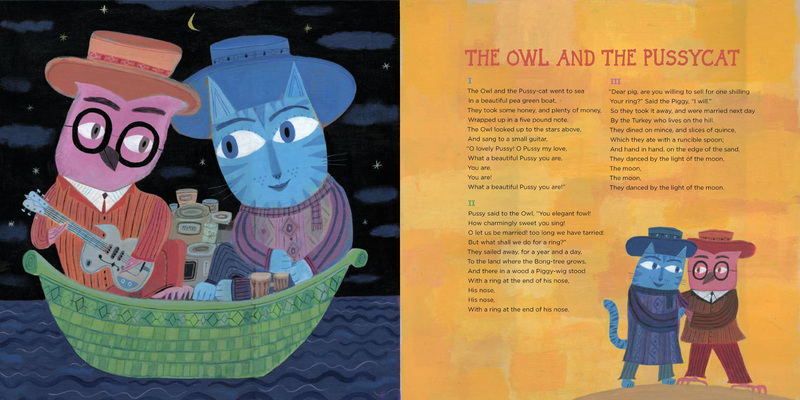 That Kirkus link is here, if you missed it last week, and below are some spreads and early sketches from Calef. I thank him for sharing. Horn Book Awards Announcement is Up! I may have mentioned seven skerjillion times or so here at 7-Imp that I like sun images. Here’s my favorite stamp. I really own … let’s see … one stamp. Yup. That one. Because a sun stamp is all a person really needs. My daughters’ burgeoning collection of dinosaur stamps disagrees with me. RAAOOOORRR! they tell me and threaten to stampede, but I still say a sun is better any day. Another reason I’m posting a lovely sun today is to inform 7-Imp readers that I’m taking several days off to go soak in some sun rays of my own. (I’m embarking on what I like to call my “redneck staycation,” but I won’t bore you with details.) Part of my goal, though it is a local staycation of sorts, is to stay away from work email and blog email and typing and Facetwitter and this, that, and the other. Think I can do it? I think so. But wish me luck anyway (because I really just like talking to many of you who live far away). I’ve got some fun and talented visitors to 7-Imp waiting in the cyber-wings. And I’ll be back on Friday. See you then. Have a sunny, most excellent week, all.